Monday’s front pages throw up a mixed bag of news — perhaps because advertisements occupy half the page of most dailies (The Times of India, Hindustan Times, The Indian Express). However, once again, The Hindu has the story of the day with its latest Rafale deal expose by its Chairman N. Ram. In “Government waived anti-corruption clauses in Rafale deal,” N. Ram writes that ‘major and unprecedented concessions … with critical provisions for anti corruption penalties and making payments through an escrow account’ were dropped days before signing the inter-governmental agreement,’ with France. He writes that the Defense Acquisition Council meeting chaired by PM Modi ‘ratified and approved’ ‘eight changes’ to the agreement. One common story today is the FIR against Mukul Roy, Bharatiya Janata Party (BJP) leader and Mamata Banerjee’s former aide, in a murder case but there’s considerable confusion on his status. TOI writes that “Roy is one of the four persons against whom sections 302 IPC (murder) and 120B (criminal conspiracy) of IPC have been slapped” in the murder of Congress MLA Satyajit Biswas, which took place Saturday. HT says he was named a “conspirator,” while the Express writes that “senior police officers declined to confirm whether Roy had been named in the FIR” along with two others accused. TOI and Express put the hooch tragedy that affected Uttar Pradesh and Uttarakhand on page 1 — others carry it inside. In “Hooch toll 116, Yogi smells a ‘conspiracy,’” TOI writes that “UP chief minister Yogi Adityanath said he smelt “a conspiracy” in which the SP may be involved.” The report doesn’t mention the number of people arrested or held in the case. It also skips Priyanka Gandhi Vadra’s comments of “shock” and the demand for an SIT probe into the case. While Congress will be pleased with Hindu’s revelations today on Rafale (page 1), it will be unhappy with the sharp editorial rebuke on invoking NSA against five people for alleged cow related “offenses” in Madhya Pradesh. TOI has advice for the BJP in “Only Connect.” The PM’s visit to the Northeast to dedicate “a slew of development projects” met with “widespread protests,” it writes, and “these point to the anger that now prevails against BJP in the region” regarding the Citizenship Bill. The bill has “two serious problems: it is inherently discriminatory” as it grants citizenship to “Hindus and other minorities” from neighbouring countries but excludes “Muslims.” Two, “it ignores the region’s long standing anxiety…about the loss of linguistic and cultural identity…” due to immigration. TOI’s advice: “The bill should be allowed to lapse” in Parliament. Prime time news offered considerable choice Sunday evening with topics on the debate ranging from “a damning dossier” on Robert Vadra (Times Now) and Amol Palekar’s curtailed speech at the NGMA (NDTV 24×7) to the “Fake Coup Part 2” (News X). The burning topic for several Hindi news channels was Monday’s visit to Lucknow by Priyanka Gandhi Vadra. 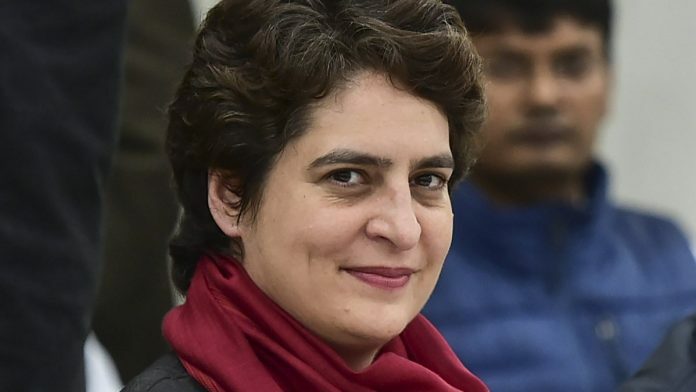 Priyanka’s audio message “ mein aar rahi hoon,” played across news channels, tantalisingly holding out the promise of more Priyanka darshan by news channels Monday. The level of debate about Priyanka isn’t always of the highest standards. On News State, BJP’s I.P. Singh became personal by commenting on Priyanka being “Christian” and therefore sporting “T-shirts, jeans.” An enraged Congressman Anup Patel shouted him down which only encouraged Singh to comment further on Priyanka’s attire, whereupon the anchor cut away from them. Meanwhile, murder was on Rajdeep Sardesai’s mind. On India Today, he discussed BJP’s alleged involvement in the murder of Trinamool Congress MLA Satyajit Biswas. Biswas was shot dead in Bengal’s Nadia district on 9 February. BJP spokesperson Chandra Bose rubbished the party’s involvement in the killing of Biswas and asked TMC to produce evidence. TMC sympathiser Abhishek Bagchi attacked the BJP, saying it had its own history of violence. On Republic TV, it was BJP’S 55 months versus 55 years of Congress rule. On Aaj Tak, Sweta Singh interviewed actor and BJP MP Paresh Rawal on Seedhi Baat. Rawal sported a hoodie with “How is the josh” — a dialogue from his latest film Uri: The Surgical Strike — printed on it in bold.